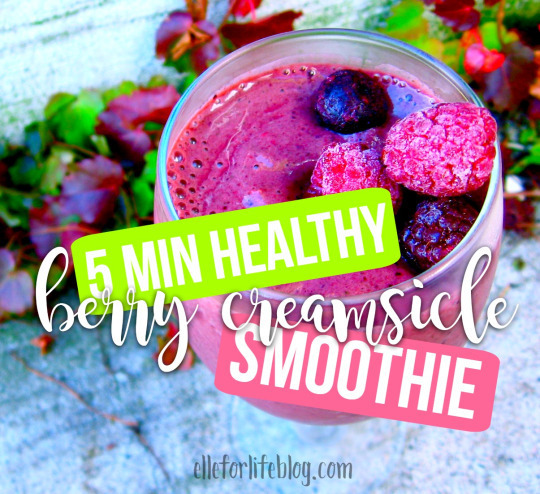 Easy & Healthy Berry Creamsicle Smoothie! Ever since I’ve been working out more on a daily basis and focusing my attention on living a healthier lifestyle (you don’t exactly have “healthy” lunch choices at my school…curly fry, anyone? ), it’s been a little hard to satisfy all my summer cravings, especially afterschool when there’s nothing I want more than a good cup of icecream. Lately, though, instead of asking my mom to drive me to the nearest grocery store to buy me icecream or walk down to the convenience store to buy a popsicle, I’ve been pulling out my blender instead. I’ve honestly never understood why people ordered smoothies at restaurants over just making them at home, especially if you’re trying to look for a healthy and convenient alternative to other not-so-healthy drinks. 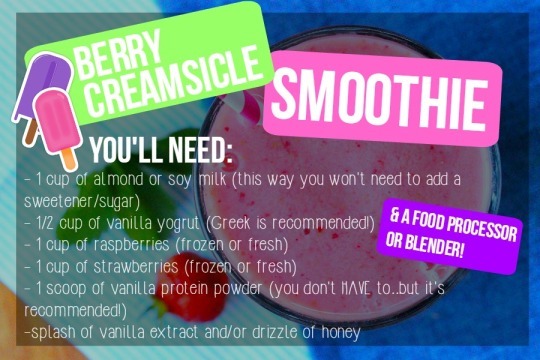 Don’t get me wrong – I love myself a nice grande latte or ice-cold Sprite, but with bikini body season right around the corner, a smoothie is the perfect way to satisfy both your sugary as well as refreshing cravings. Especially if the words “berry,” “healthy” and “Creamsicle” are involved with it. Makes one to two servings, depending on how much you want to hog to yourself. And that’s it! If you have any leftovers (which I doubt will happen, I promise) or want something even closer to the real thing, pour the smoothie into popsicle pans/trays and freeze for a few hours. The result is basically a Creamsicle minus added sugars, those really long words on the “Ingredients” list and those extra calories for the same great, refreshing and satisfying taste! Remember to comment down below if you make this, or tell me your favorite summer treat! DIY Cotton Candy Lip Scrub!